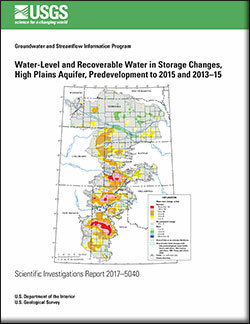 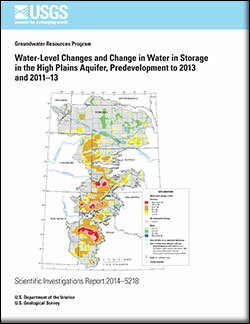 McGuire, V.L., 2017, Water-level and recoverable water in storage changes, High Plains aquifer, predevelopment to 2015 and 2013–15: U.S. Geological Survey Scientific Investigations Report 2017–5040, 14 p., https://doi.org/10.3133/sir20175040. 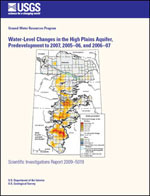 Scanlon, Bridget R.; Faunt, Claudia C.; Longuevergne, Laurent; Reedy, Robert C.; Alley, William M.; McGuire, Virginia L.; McMahon, Peter B. 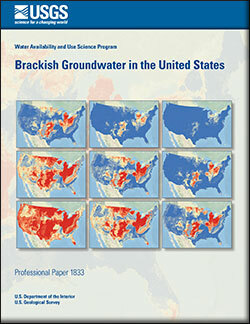 Groundwater depletion and sustainability of irrigation in the US High Plains and Central Valley; 2012; Article; Journal; PNAS; Scanlon, Bridget R.; Faunt, Claudia C.; Longuevergne, Laurent ; Reedy, Robert C.; Alley, William M.; McGuire, Virginia L.; McMahon, Peter B.
McGuire, Virginia L.; Lund, Kris D.; Densmore, Brenda K.
Saturated thickness and water in storage in the High Plains aquifer, 2009, and water-level changes and changes in water in storage in the High Plains aquifer, 1980 to 1995, 1995 to 2000, 2000 to 2005, and 2005 to 2009; 2012; SIR; 2012-5177; McGuire, Virginia L.; Lund, Kris D.; Densmore, Brenda K.
McGuire, Virginia L.; Ryter, Derek W.; Flynn, Amanda S.
Altitude, age, and quality of groundwater, Papio-Missouri River Natural Resources District, eastern Nebraska, 1992 to 2009; 2012; SIR; 2012-5036; McGuire, Virginia L.; Ryter, Derek W.; Flynn, Amanda S.
Changes in water levels and storage in the High Plains Aquifer, predevelopment to 2009; 2011; FS; 2011-3069; McGuire, V.L. 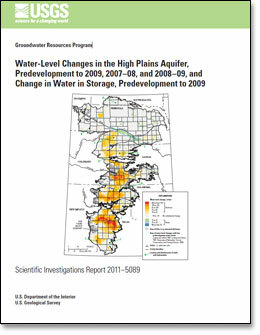 Water-level changes in the High Plains aquifer, predevelopment to 2009, 2007-08, and 2008-09, and change in water in storage, predevelopment to 2009; 2011; SIR; 2011-5089; McGuire, V.L. 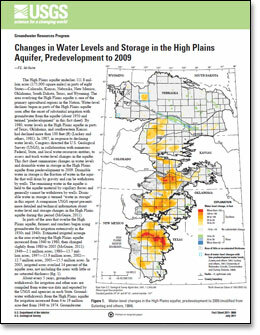 Water-Level Changes in the High Plains Aquifer, Predevelopment to 2007, 2005-06, and 2006-07; 2009; SIR; 2009-5019; McGuire, V. L.